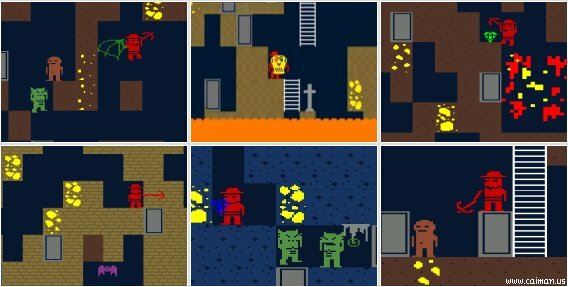 Caiman free games: Excavatorrr by Arvi Teikari. 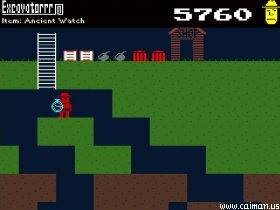 A very good roguelike-platformer with retro graphics with online highscores! You play as a lonely excavator, who seeks for riches from the depths of the underground world. Of course there're loads of enemies and obstacles to be passed, but who knows what lies down there, just waiting to be found? You get money by collecting money and bringing jewels to the shop. Also golden idols are welcomed to the shop, they're worth of muchos pesetas! Try to continue deeper, but keep in mind your jump height, and always ensure you can get back! It's a good idea to carry a Ladder Kit with you all the time. Look out for falling blocks, and also look if you can see tiles that have different texture than the others, they may hold secrets! Remember also the falling damage. * LADDER KIT - Most useful item in the whole game! Press D while holding to make a ladder downwards appear in front of you. Ensure that there's enough space in front of you for the ladder to continue. Hold UP and press D to make the ladder appear from where you stand, and upwards! Each ladder kit has 3 ladders. * BOMB - Throw it to explode some enemies and blocks out of the way. Doesn't have a very good range and explodes quickly, but is otherwise very usable. * DYNAMITE - Same as bomb, but you can't throw it, just set to explode and drop. Explodes with a great range. Due to the non-throwable-ness, it's clever to try to stand near a cliff or be in ladders while setting it on. * SPRINGBOARD - Throwable around, it makes enemies, items and you bounce around like crazy. Look out though - the bounce height is so big you might hurt yourself! * UMBRELLA - Slows your falling so that you don't hurt yourself. Throwable. * DRILL - You can use the drill to dig straight downwards or upwards, using D and D + UP! Useful, but remember to look out so that you can return back! * ELECTRIC STUNNER - Now this one actually kills enemies. It does great damage, and can be aimed diagonally upwards with UP + D. The electric charge can sometimes even hurt enemies through a wall! Up / Down arrows = Look up/down, and use ladders. S = Jump. Your jump is about 3 tiles high. D = Attack/Use things you have in your hands. Usually just throw them. D + Down = Pick up/Put down. THIS IS IMPORTANT! You really need those items, y'know! Up arrow = Enter shop. Very useful! HGR - The High Gravity . 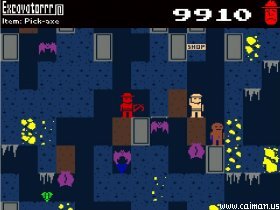 Dungeons of Grimlor 2: .